In March 2008, a UN-mandated European military peacekeeping mission, EUFOR Chad/CAR, arrived deep into war-torn and impoverished Chad, the dead heart of Africa. Chad was caught up in the bitter and bloody conflicts raging across its border in the Darfur region of Sudan, and every day traumatised refugees streamed into the country seeking a respite from their woes. They came in their thousands, carrying their memories of horror and war with them. But Chad had its own problems. The poverty-stricken country was facing growing unrest and instability as internal tensions, age old ethnic rivalries, raiders, the fearsome Janjaweed and formidable rebels threatened to undermine its already fragile state of security and weak economy. 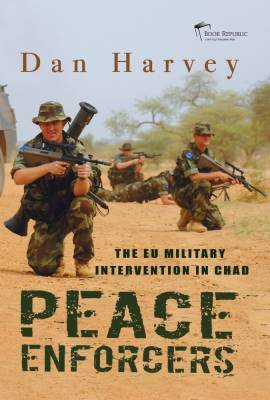 Lawlessness and impunity threatened to cannibalise the country, and EUFOR’s mission was to rescue Darfur’s refugees and Chad’s most vulnerable people from the clutches of conflict. The mission was to prove more complex and problematic than anyone had anticipated. Just getting the troops to Chad was a massive undertaking, and the mission was almost over before it had even begun. Written as a result of his experiences in EUFOR’s Operational Headquarters, Commandant Dan Harvey documents how it fell to Irish Lieutenant General Pat Nash, and the forces under his command, to bring EUFOR from mission impossible to mission accomplished in Peace Enforcers.